Miao & WafuPafu Comic Blog » Stop following Us..
« Something Crossed the Street..
Posted on June 25, 2010 by Jian Akiraceo. This entry was posted in Rant and tagged melaka, Portuguese settlement, seafood stall. Bookmark the permalink. for the support all this long!!!! We did.. but they don’t want leave us alone..
Not only there, sometimes in shopping malls too. the promoter keep following. I feel uncomfortable. It’s still early for dinner..
and we wanted to walk around before the meal..
How come u didn’t invite me makan there one geh? Sound romantic eating at there wor. No! Miao, don’t jump! Haha! My friend and I would pretend to be blind and deaf. We won’t even say No. We would just completely ignore him. wwwwwwwwwweeeeeeeeee…..~~~~why u jump..?? 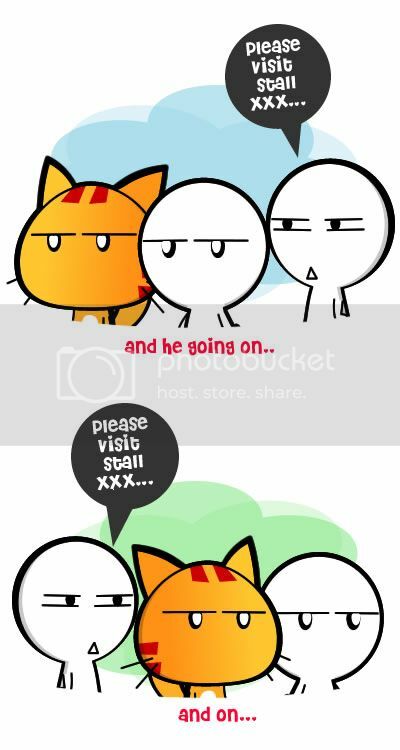 ?why dun just u go n eat at his stall then..?try it first..then next time go for ur fav stall…heheheh..~! !but miao ssssssssssssoooooooooooo cccccuuuuutttteeeee…~!! 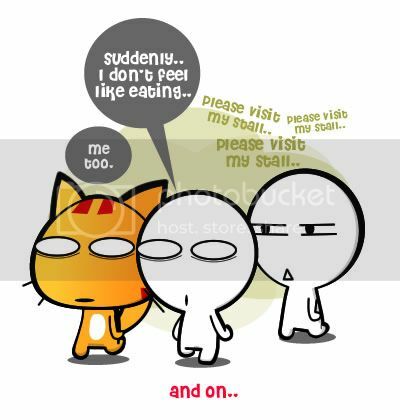 geezz.. i si beh don like ppl trailing around also.. spoilt appetite only..
Miao ~ i wish i could meet u in person too ! ur my blog idol ! hahahah !! I’m currently a student in Malacca too =) i’m the ambassador for sarawakian’s from my hometown who wants to come to Malacca .. hahaha ! and u remember ur post about finding a centipede in the food ? i didn’t know what restaurant was that until i was eating at the chicken rice ball shop opposite .. and saw the signboard … and suddenly RANG a bell and connected me to ur post in ur blog ! Hahaha !! then i was telling your story to my friends … and indirectly promoting ur blog .. hahahha !! no miao don jump! We still need chu ~,~ but ho, the promoter really a bit scary la. He gave us the creeps! 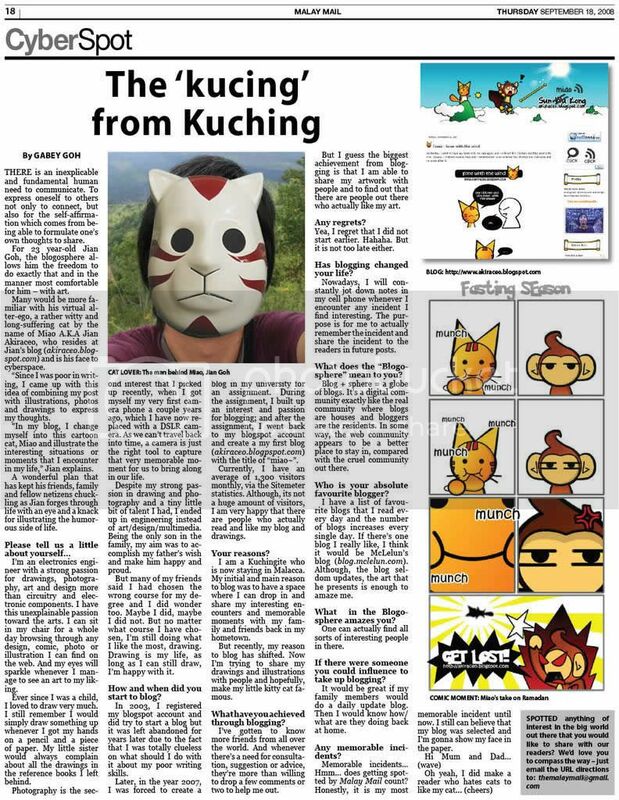 Miao, r u staying in Melaka? As for this post, it’s pretty funny too. Haha, poor guy, very desperate, but annoying right…? then I must have jump..
What did you googled back then? Consider complain to the management perhaps? I’m sure this ruins experiences of many tourists. heading to portuguese settlement for portugal v spain match ! woohoo ! !